With the first Jurassic Park, we were all content to just stare in awe at what appeared to be living, breathing dinosaurs onscreen. But four sequels later, we now want to do more than just look at dinosaurs, we want to play with them too. 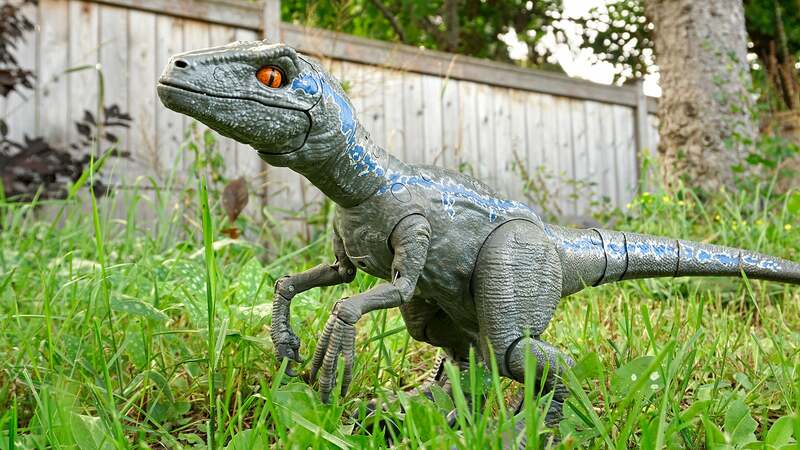 Science has yet to deliver the goods, so Mattel has stepped up to bring dinosaurs back from extinction with its new Alpha Training Blue interactive velociraptor toy. 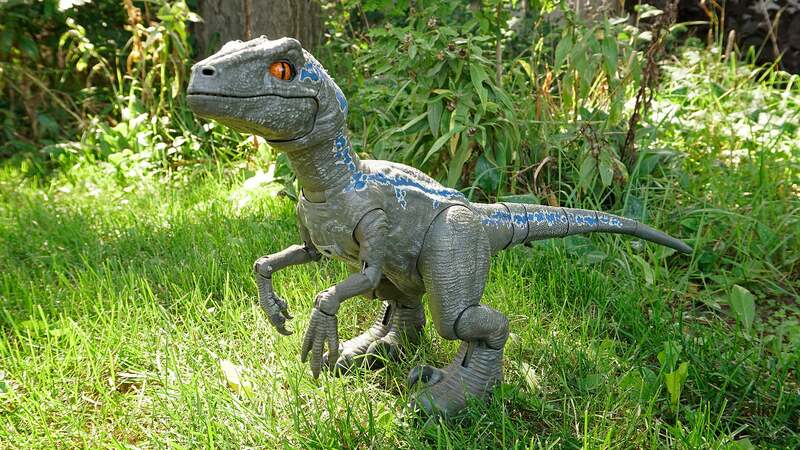 Standing almost 41cm tall, the toy is based on the younger, smaller version of Blue the velociraptor we’re introduced to during flashbacks in Jurassic World: Fallen Kingdom. 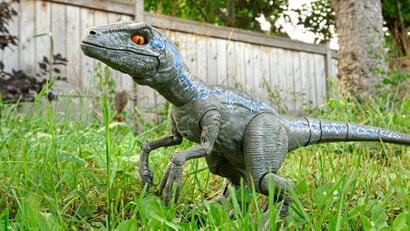 Like Chris Pratt’s Owen Grady does in both of the Jurassic World movies, this version of Blue can be trained to be friendly and perform basic tricks on command, but it won’t provide much help if a rampaging Indominus Rex has eyed you for a quick meal. Created by Michael Kadile, a project designer at Mattel who was also responsible for last year’s two-foot long, smoke-spewing, RC Batmobile; Alpha Training Blue features a mottled paint job and detailed sculpted textures that really do give the impression of lifelike skin—even if the dino is actually made of hard plastic instead of soft rubber or silicone. But it’s the toy’s movements that really help sell it as a living, breathing creature. Blue is able to raise and lower her head and neck, tilt her body forwards and back, and turn her head from side to side. Her jaws can open and close with a snap that sounds a lot more powerful than it really is (stick your finger in her mouth and you’ll barely feel it) and moving eyes and eyelids add to the realism. 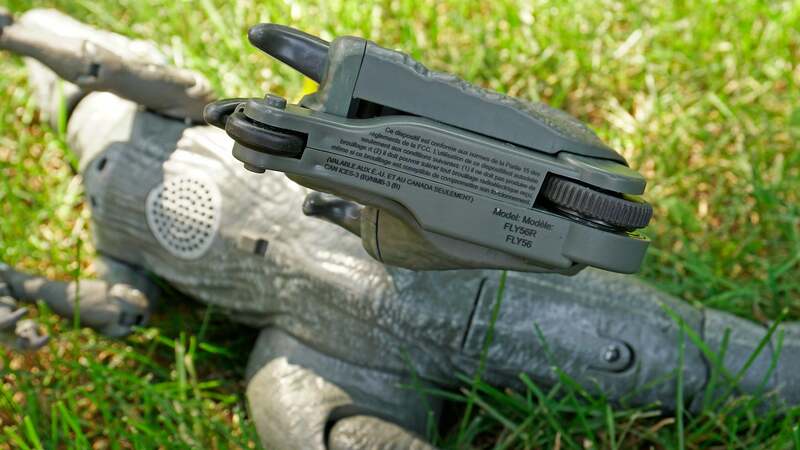 An army of motors and servos power the toy’s subtle movements, but they’re definitely not quiet. If you want to convince yourself that Blue is truly alive, you’ll need to muster some suspension of disbelief to tune out all the grinding and whirring sounds she makes. 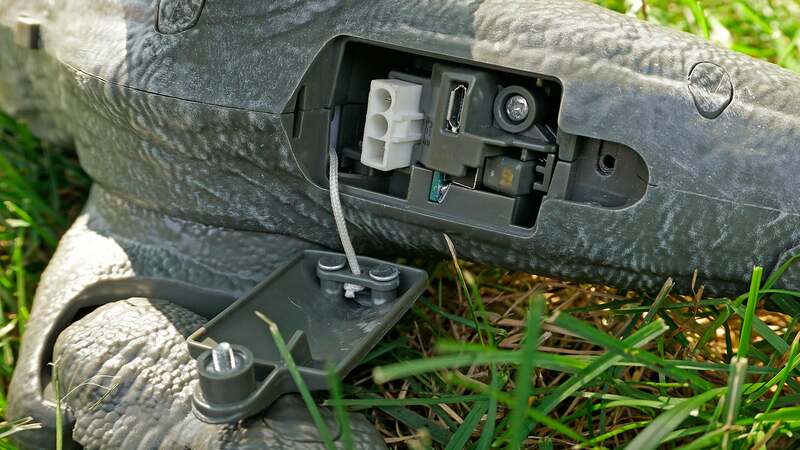 On the underside of the toy, you’ll find a power switch, a speaker that blasts out roars and other raptor-like sound effects (you can, thankfully, turn down her volume) and what appears to be a pair of inline skates customised for dinosaurs. They’re not for X-Games competitions, however. They’re actually part of the mechanism that allows Blue to turn her body and walk around. As a result, when Blue walks her movements fall somewhere between the motions of a velociraptor—with a bobbing head and body, and legs and feet that move up and down—and an inline skater out for an evening cruise. The toy uses a long articulated tail to help it balance when in motion, but I found that smooth surfaces like tile floors were about the most exotic terrain the baby dino could reliably traverse. Even the rough texture of a cement footpath often had Blue falling over and requiring rescue, as do sudden quick turns. There are three ways you can play with Blue, and they each use an included wireless remote control. Training mode has you using the remote to teach Blue tricks, starting with basic head movements, and then transitioning to more complex stunts with her spinning in place, or roaring on command. One button makes a loud clicking sound which grabs Blue’s attention, while another dispenses treats, providing positive feedback when she obeys. You can also help build a bond with Blue by simply petting her snout, which is detected by embedded touch sensors. Over time Blue will get friendlier and more obedient, and while the process isn’t as arduous as teaching a puppy (there’s no newspaper on the floor to change either), Training Mode is definitely for someone far more patient than I am. I had a lot more fun with the toy’s Total Control and RC modes, which allow you to control all of Blue’s animated features using the remote’s buttons and joystick, or make her walk around. You just can’t do both at the same time, given the simplistic controls on the remote. 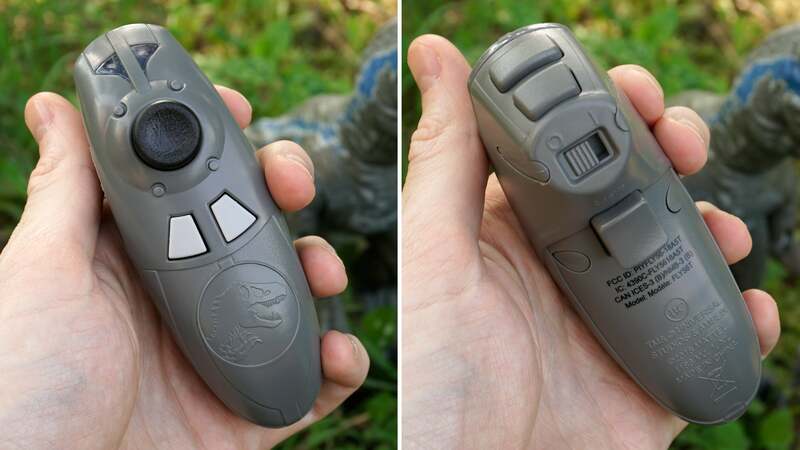 The toy’s built-in mic and other sensors also power a Guard Mode that will have Blue send a vibrating alert to the controller when she detects nearby movement. But, sadly, she can’t be programmed to attack first and ask questions later. 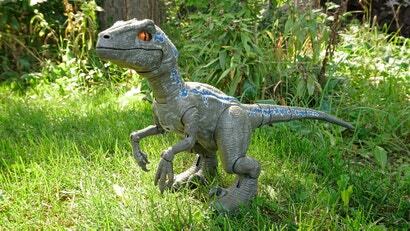 If you’re a longtime Jurassic Park fan, this is a fun toy to leave perched on your desk. When left alone Blue will make random movements and noises, like having a cat keeping you company while you work, but without the risk of being slashed. If I had to make one “shake my fist in the air” complaint about Blue, it would be about her charging port. Rechargeable batteries in a toy are always appreciated, but you’ll need to find a screwdriver to open a small, secured door every time you need to plug her in. Alpha Training Blue will be available starting on September 1, but can be pre-ordered starting today on Amazon. 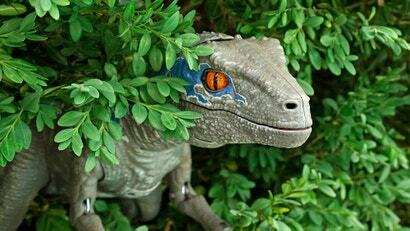 You don’t need to be a billionaire investor funding the cutting edge of genetics research to finally own a velociraptor, but you will have to cough up $340. That’s not cheap, even compared to Sony’s new $US2,900 robotic dog. But grab three or four of these and you’re one step closer to opening your own Jurassic Park. What could possibly go wrong?